Volume 2, Patient Assessment, addresses the various steps and facets of patient assessment. The first two chapters discuss scene size-up and primary assessment. 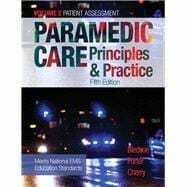 The next three chapters present the techniques of conducting a comprehensive secondary assessment, along with history and physical exam, and discuss communication techniques for doing so. The sixth chapter presents an overview of patient monitoring technologies. The final chapter discusses ways to apply the techniques learned in this volume to real patient situations. Updated with new information on Point of Care Testing, using ultrasound technology in the field, and recommendations for primary assessment, Volume 2 provides paramedic students with the principles of patient assessment.